January's Canby Area Recognition of Excellence Award went to Knight Elementary's kitchen cook Ginger Miller. She was honored at the January school board meeting, where Knight Principal Christine Taylor described surprising Miller with the award earlier in the week. Taylor knew it would be a feat to get Miller out of the kitchen for the surprise, but managed as students waited in the cafeteria. "We get part way out, and she turns to me and she says, 'Should I get lipstick on?' And those of you who know Ginger, that is a total Ginger comment," Taylor said. Each month, Canby Kiwanis and Canby School District honor a district staff member with this CARE Award. Canby Kiwanis established it to provide opportunities to recognize individual teachers, counselors, coaches and other school staff who make a difference in the lives of others and in the community. The prospective recipients must be nominated, and the honoree is then decided by a CARE committee made up of members from Kiwanis and the community. Miller was nominated by Canby Fire Battalion Chief Todd Gary. Both Gary and Fire Chief Jim Davis attended the board meeting for the award presentation. "I have had the honor of being asked to help at several special days at Knight Elementary School throughout the years," Gary said in the nomination letter. "Ginger Miller has always made sure that the firemen have washed their hands." Gary went on, "I watch her in the kitchen. She's going a million different directions to make sure everyone is take care of…She puts that same effort and heart into the first lunch as she does the seventh lunch of the day." Superintendent Trip Goodall expressed how incredible it is for Miller to have received the nomination from the fire department. Taylor agreed saying, "I'm so thrilled. And thank you so much for noticing. She goes above and beyond, and it's just amazing." 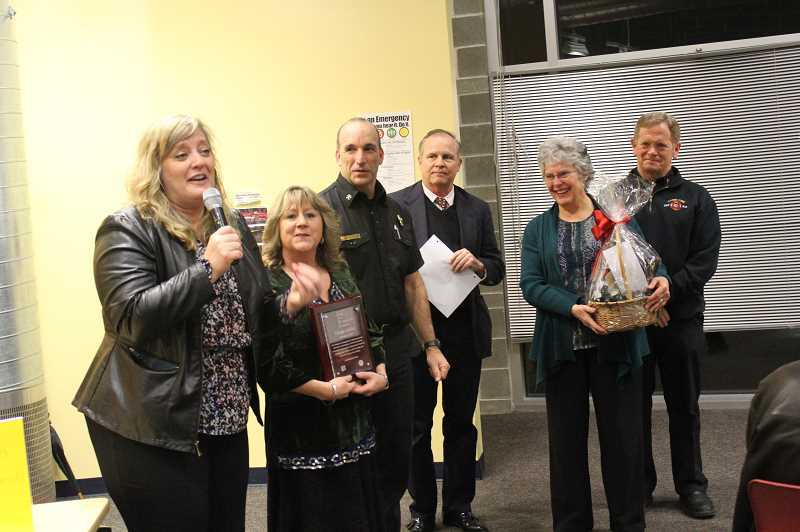 Miller received a plaque and a gift basket from local businesses in recognition of her work. Local sponsors of the CARE Award include Canby Kiwanis, State Farm Insurance-Matt Olsen, Columbia Bank, DirectLink, The Wild Hare, Backstop Bar & Grill, Rice Time, The Human Bean, Cutsforth Marketplace, Gwynn's Coffeehouse, Team Spirit and Puddin' River Chocolates. To nominate someone who you believe is deserving of the CARE Award, nomination forms can be found on the district's website.